Charles tugs at the collar of his faded T-shirt and points to a large white rash on his neck. He’s 45 years old, sleeps on a park bench most nights, and has no one to care for the fungal infection that is causing his itching. This night, however, UCF medical students and their faculty advisors are offering relief. 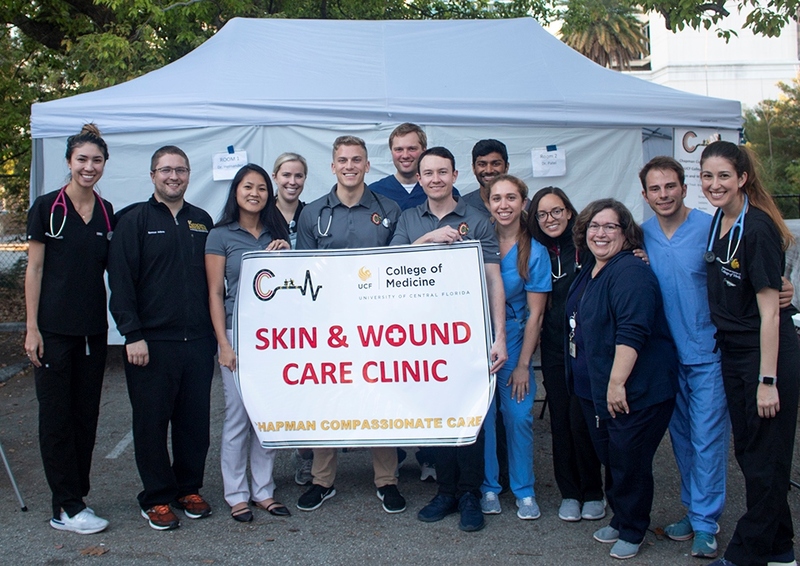 They’ve started Chapman Compassionate Care for the Homeless, which runs skin and wound clinics for downtown Orlando’s homeless population and connects them with local healthcare resources. The first clinic in January saw about two dozen people. The most recent, on April 2 at St. George Orthodox Church, provided wound care to 12 patients and Hepatitis A vaccines to over 25. With no access to healthcare and living in unsanitary conditions like abandoned buildings, parks and street corners, homeless people are susceptible to burns, fungal infections, psoriasis and dermatitis that, left untreated, can cause serious health problems. The UCF team provides anti-inflammatory and anti-fungal medications for patients like Charles. They remove calluses, bandage wounds and provide patients with information on nearby clinics that can provide follow-up care. 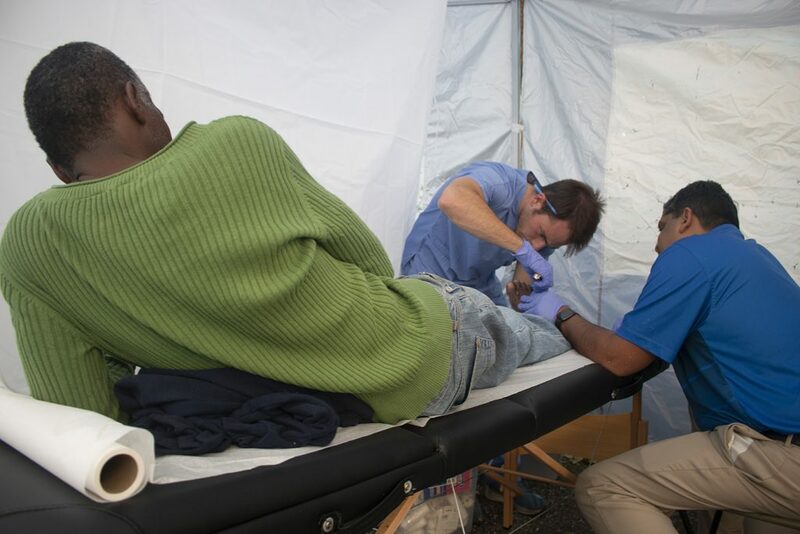 That motivation led the clinic to partner with the Florida Department of Health to provide the vaccinations against Hepatitis A, a highly contagious liver infection that is increasing among Orlando’s homeless population. UCF’s wound clinic was more than two years in the making. Fraser got the idea as a first-year medical student when he spoke with a friend about Tampa Bay Street Medicine. That clinic, run by University of South Florida medical students, cares for homeless people on the street and in shelters. Fraser thought the idea could work in Orlando, and contacted classmates Sellers and Friedes, who shared his passion. 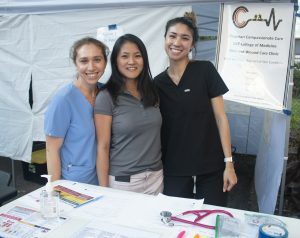 The students connected with local physicians and volunteer organizations to assess community needs. They realized quickly that their patients faced additional challenges in getting access to medical care, especially transportation. Another challenge is hygiene. Some patients have arrived at the clinic with painful and infected diabetic foot ulcers, which return because people lack access to clean showers and clean clothes. “So we try to supplement that with giving them clean socks and a hygiene kit,” Sellers said. Thanks to the generosity of the Jules B. Chapman, M.D. and Annie Lou Chapman Private Foundation, the clinic will be receiving $100,000 over the next five years. The Ft. Myers-based foundation promotes the values of humanism in medicine and currently funds several College of Medicine initiatives, including the Chapman Chapter of the Gold Humanism Honor Society, narrative medicine and wellness programs. With the additional funding, students hope to start a needle exchange program, develop health education materials and find additional partners to provide more resources, including mental health care.